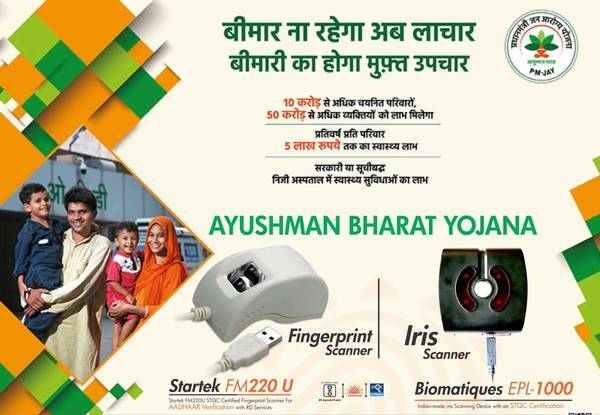 WE ARE THE AUTHORISED SUPPLIER AND DISTRIBUTOR FOR ALL TYPES OF AYUSHMAAN BIOMETRIC DEVICES. BIOMETRIC KIT CONTAILS BIOMATIQUE IRIS SCANNER EPL1000, STARTEK FINGERPRINT SCANNER STARTEK FM220 AND QR CODE SCANNER RETSOL 2030D IS THE COMPLETE PARTS OF THE AADHAAR CARD KIT. IRIS SCANNER FOR VERIFICATION OF AADHAAR CARD HOLDER THROUGH SCANNING EYE RETINA AND FINGERPRINT SCANNING DEVICE IS THE COMBINATION WHICH IS USED TO CREATE AYUSHMAN CARD AND VERIFIY THE SAME WHILE PATIENT PRODUCES IT TO GET SERVICES.